With my interest in gardens and all the garden pictures that I have, I've started doing presentations to garden speaking to garden clubs and horticultural societies. The first is "From Snapshot to Great Shot - Explorations in Flower and Garden Photography". The second is "Exploring Great Public Gardens of North America in Search of Magic and Mystery". The third one is "The Romantic Garden is Alive in Great Public Gardens of North America". I just completed this last presentation for the Master Gardens of Niagara. A lengthier version will be developed for the Toronto Botanical Gardens (TBG) Seminar series in February near Valentine's Day. This longer version will delve into the romantic flowers as well as romantic garden design and elements. Certainly the romantic flowers are well known - we would all guess roses at the top of the list, and then there are daisies, irises, lilies, carnations, lilacs, wildflowers and sunflowers. I would add the draping flowers like wisteria, laburnum, and jasmine. Of course who would resist a field of lavender. 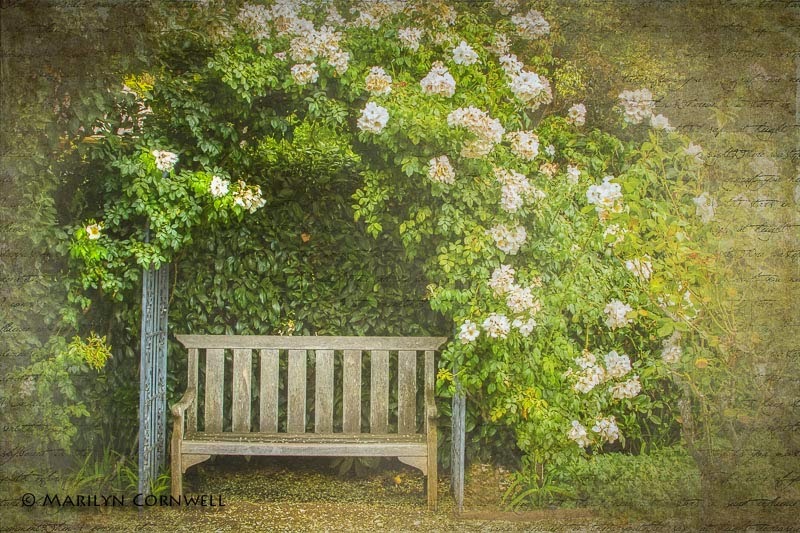 So today's image celebrates the romantic garden element of the bench on the path, draped in the soft colours of a romantic rose on a trellis. This is at Filoli, a great historic house and public garden, just south of San Francisco. I consider it one of the great Romantic Gardens of North America.